It’s here, it’s here! Christmas week is upon us – my absolute favorite week of the year (besides my birthday, obvs). When it comes to food holidays, Christmas ranks at the top for me, so it’s no surprise I wanted to go all out and share all of the plant-based recipes we have on the blog that would be perfect for your holiday gatherings. This round-up reaches back to the early days of Minimalist Baker (aaahhh), right up to the present, and includes recipes for breakfast, sides, appetizers, entrées, desserts, and drinks. We’ve got you covered. Let’s dig in, friends! And there you have it! We hope your week is spent with the ones you love most, and is filled with all the delicious food. So very thankful for you all. You make our holiday joyful and bright. Merry Christmas, friends! What an incredible number of plant-based recipes for the holidays. Maybe you should have a Christmas book with all of them. The holidays are the hardest for me to plan for because most of the guests want traditional food and I want them all to have healthy, delicious plant-based food. Are all of these recipes available in one cookbook that can be purchased? I’ve already printed out about 25 recipes, but would love to find all of them in one cookbook. Hi Debbie! Sorry, these are only available for free here on the roundup! I am so grateful that I came across this site. I am spearheading my families transition to a more plant-based diet. Your recipes are not intimidating nor costly; of which, has been my issue of proceeding down the path of healthier eating. Thanks so much! Thank you soooo much for posting all these wonderful recipes! I have posted your link on my FB page “10 Minute Plant Based / Vegan Activism” so my followers can not only enjoy them, but can also forward them on. Hope this helps bring more followers to YOU! This list is amazing! This is the most comprehensive, concise vegan food list for Christmas I’ve ever come across! I am big fan of vegan recipes. I love deserts so much. Chocolate pad is my favorite desert in sweet dishes. Last weekend, I cook chocolate pad and it was very yum I cannot forget the taste. Great collection of Delicious , yummy recipes. This list is so beneficial to me that i can’t explain. Thanks for sharing . Wish you a Happy New Year. I’m a subscriber. How do I access the detox guide. Really want to check it out. Literally all of this is serious perfection <333 Thanks for the round-up! It'll definitely come in handy. Hell yes I want cinnamon rolls, waffles, tofu scrambles and cookies for breakfast! I HAVE to try that sweet potato lasagna! Just can’t say Thank You enough! You are becoming my go to for vegan recipes which I am now including more and more. Always flavorful and healthy. Really helpful when I am meal planning. Really excellent – maybe too many good choices it’s overwhelming. So kind! Thanks so much, Lorelei!! Perfect timing! I was getting started with menu planning, and this appeared in my inbox! Thank you!!! Thanks so much for all the inspiration! Look forward to another year of delicious recipes. Have a wonderful Christmas! 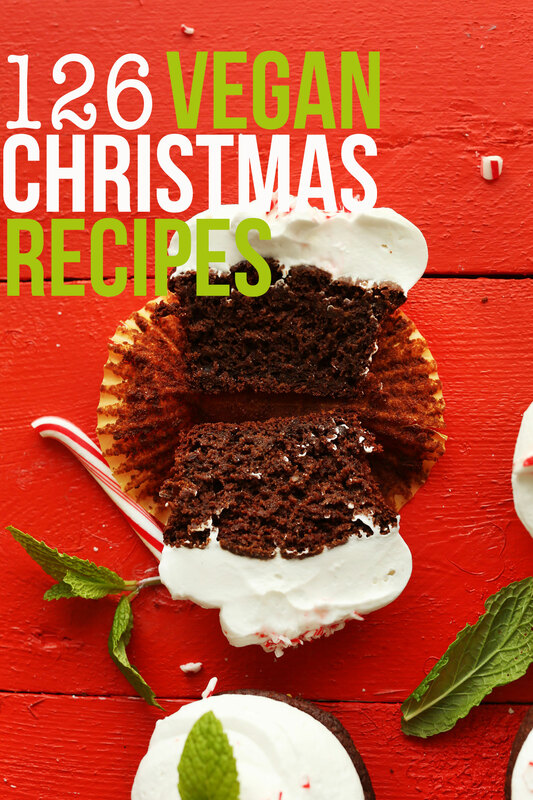 To have your recipes, all together in one single post is a Christmas gift! Thanks and Merry Christmas to you too! There are so any delicious looking recipes, I honestly have no idea where to start, haha. The hazelnut chocolate cake caught my eye though! Ha! Lovely request. Adding it to my list for next year! Yes please do! i was just looking for a yule cake recipe here. I think I might flavour it with amaretto. I’m making a chiffon cake for the cake part, which calls for lots of eggs, but I thought I’d share my inspiration. That sounds delicious! I made a delightful mousse out of coconut cream but I have trouble with the sponge because they all call for so many eggs and I feel if I sub that many it will ruin it.